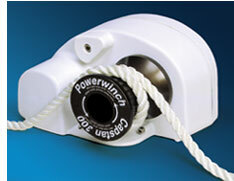 The Capstan 300 is a smaller power assisted rope capstan for a variety of uses for boats up to 26'. It has a maximum pull of 300 lbs with a retrieval speed of 85 feet per minute. Whether anchoring, sailing, or fishing, let the Capstan 300 help spare your back, speed up your retrieval process, and make your boating more pleasurable.